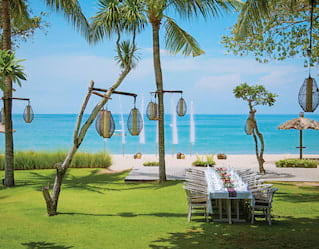 Teetering on the fine white sands of one of Bali's most exclusive bays, Belmond Jimbaran Puri is an idyllic destination for weddings and events. 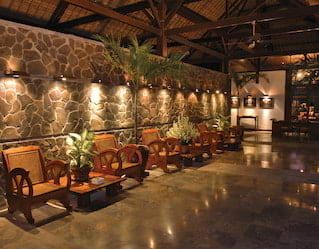 An enviable location between jungle and beach spirits guests into a tropical paradise, while tailormade occasions are crafted to your liking. Indonesian mythology permeates every inch of Bali's lush landscape, making Belmond Jimbaran Puri a magical spot for wedding parties. Pristine sands, tall palms and sweeping sea views create a sublime backdrop for unforgettable celebrations. 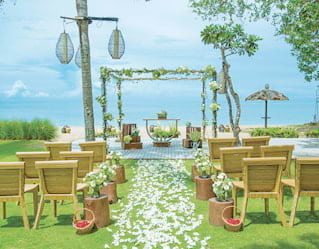 For ocean lovers, feel the sand between your toes during an authentic Balinese ceremony on our tranquil beach. Or enter our Puri Bamboo Pavilion–adorned with fragrant frangipani–as the lulling soundtrack of waves accompanies your "I do". Flanked by lush Indonesian jungle on one side and flawless beach on the other, a Bali honeymoon is even more magical at our secluded hideaway. Pick a spacious thatched villa or cottage, then relax in your own private garden as a butler serves up spicy Asian snacks or tropical smoothies. Sunset snorkels or boat tours are perfect for adventurous couples. Return at sundown for a delicious seafood barbecue under a lilac sky. 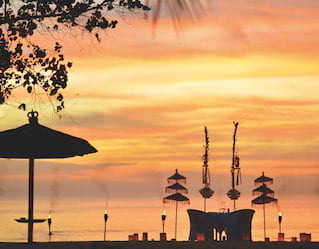 Create spectacular memories for you and your loved ones with an indulgent escape beside one of Bali’s best beaches. Whether a landmark anniversary or milestone get together, our concierge can happily coordinate activities and experiences for every age and interest. Alternatively switch off and unwind—sometimes good company and phenomenal surroundings are all that’s needed. For a professional workshop, team-building event or corporate gathering, our elegant pool villas are an ideal venue for a memorable event. Accommodating up to 10 people, our events team will work with you to coordinate gourmet catering, luxury amenities, outdoor activities and technology required to create a talking point event.